Terry Gilliam’s career as a filmmaker has been a rollercoaster ride of highs and lows, perhaps more so than any other contemporary director. From the comedic genius of Monty Python and the Holy Grail to the masterful Brazil and other fine films such as Time Bandits, The Fisher King and Twelve Monkeys, Gilliam is responsible for some of the most interesting movies of the last 40 years, yet he has continually struggled in recent times to secure the necessary financial support for his projects. I generally like Gilliam’s work, even those films derided by almost everybody else, such as 2005’s Tideland, because even his most flawed films offer something that is interesting and thought provoking. Of course, his fruitless attempt to make The Man Who Killed Don Quixote is the stuff of legend and whilst he has refused to allow the myriad setbacks and disappointments to curb his output, it is obvious that, despite his considerable talents, his vision has been compromised by his inability to secure the backing needed to craft his projects into something truly great. 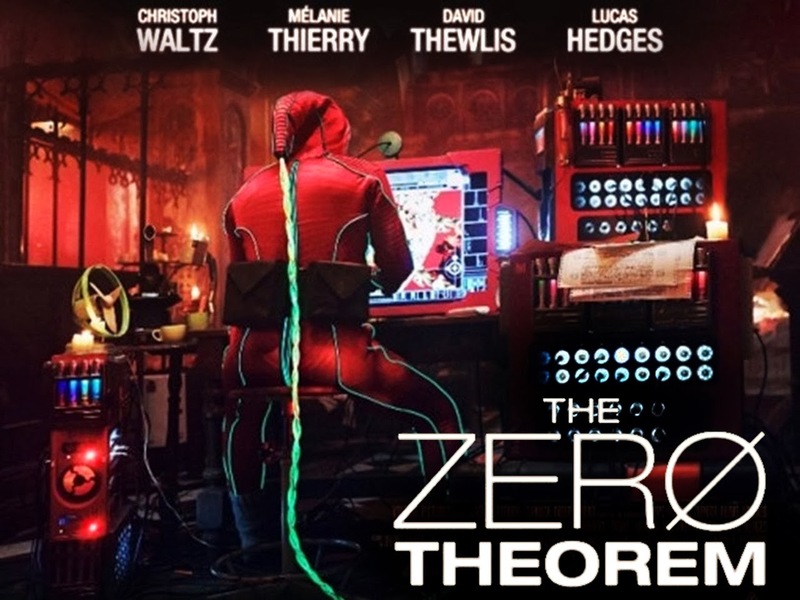 With his latest effort, The Zero Theorem, Gilliam again demonstrates a flair for the absurd and a willingness to address the big issues, albeit in ways that are not necessarily easy to understand. The film is a visual feast, particularly the external scenes of an urban landscape dominated by garish neon and talking billboards spouting all kinds of messages, very similar to the world created by Ridley Scott in Bladerunner, while the elaborate costuming is reminiscent of Luc Besson’s The Fifth Element. Set in the near future, the narrative revolves around Qohen Leth (Christoph Waltz), a misanthropic data crunching computer programmer with agoraphobic tendencies who spends most of the film in the former church that now serves as his home; resplendent with a steam punk aesthetic. When he is drafted by Management (a bleached blonde Matt Damon) and tasked with finding the reason for human existence, Qohen insists on working from home. However, much to his chagrin, his progress is interrupted on several occasions by unwanted visits from a cast of wacky characters, including the flirtatious Bainsley (Mélanie Thierry), his supervisor Joby (David Thewlis) and digital therapist Dr Shrink-Rom (Tilda Swinton). The final indignity comes when Management sends his wunderkind son Bob (Lucas Hedges) in to assist when Qohen finds himself on the brink of madness. As Bainsley, Thierry brings a terrific sense of fun to this pixie dream-girl force of nature determined to roust Qohen from his malaise. Of course, Qohen is suspicious of her presence – has she been sent by Management to test him in some way? – yet finds himself unable to resist her charms and the promise of a peaceful paradisiac existence away from all the things that rankle him so much. Thewlis is very annoying as Joby and perhaps that is intentional to enable us to understand why Qohen is so irritated by him, while an almost unrecognisable Swinton provides comic relief as the online therapist who seems more bonkers than anybody. Gilliam presents a vision of the future that may, or may not, be too far removed from reality. One of the most amusing moments is a scene in which Qohen is sitting on a bench in front of a wall of signs that declare all of the activities that are prohibited, no doubt Gilliam’s way of critiquing a society in which rights and freedoms are being whittled away. It is very difficult to give any definitive explanation of what The Zero Theorem is about exactly and it is this elusiveness that is perhaps its biggest drawback. However, there is a clear message about the futility in waiting for answers rather than simply accepting life as it comes. Shot on location in Romania, this is an ambitious and personal film that many will find difficult to embrace. 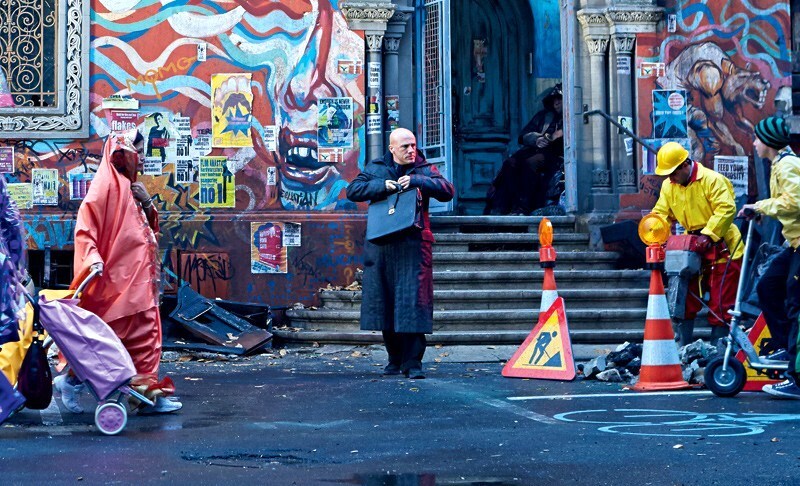 Whilst The Zero Theorem is a long way from being Gilliam’s best work, this vision of the future – candy-coloured yet bleak – is certainly not a disaster and is better than so many of the cookie-cutter releases that clutter cinema schedules. We need original filmmakers like Terry Gilliam and it is really important that filmmakers like him are able to realise the full extent of their artistic vision, unhindered by the vagaries of a funding model that privileges the asinine over the intelligent when it comes to cinema stories. Next Next post: Will the Bullying Ever End?